Control lamps and small appliances wirelessly with your smart phone or laptop. Monitor energy consumption in live mode or over time. Save on bills and enjoy a more efficient home. Build your own schedules and events designed around your needs. Use advanced configurations to allow or disable manual control of the plug. Set the timer to turn appliances off automatically. 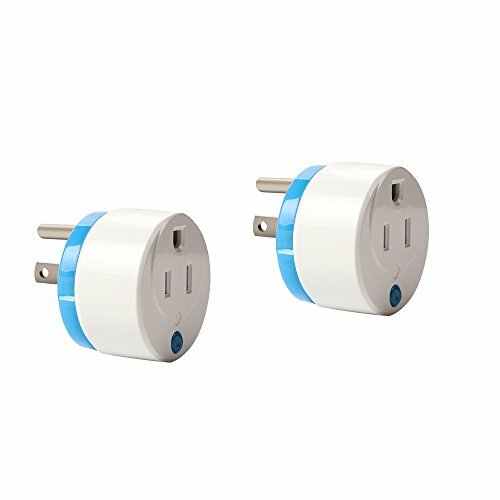 Installation is virtually instant, and a compact size gives full access to the second outlet in a standard receptacle. Z-Wave Plus provides faster and safer wireless connectivity. The built-in range extender guarantees a stronger network. ➤Instant Wireless Control:Control lamps and small appliances wirelessly with your smart phone or laptop. ➤Energy Efficient:Monitor energy consumption in live mode or over time. Save on bills and enjoy a more efficient home. ➤APPLICABLE TO MULTIPLE HOSTS:the Sensor is compatible with following brand alarm host:Fibaro/Vera/Zipato/Wink.It can't work alone and need work with their alarm host.In the Z-wave network communitcaions,power plug can be connected to any z-wave main controller. ➤Complete Customization:Build your own schedules and events designed around your needs. Use advanced configurations to allow or disable manual control of the plug. Set the timer to turn appliances off automatically. If you have any questions about this product by haozee, contact us by completing and submitting the form below. If you are looking for a specif part number, please include it with your message.